ISSA - International Slalom Skateboarding Association • View topic - i cant take out my bearings from the OS axles!!! i cant take out my bearings from the OS axles!!! is amazing the traction that OS trucks can give if they are "well tuned". i wanted to clean my bearings but, when i pull out the 3DM, the inner bearings stayed (with washers) in the axle. They re stuck!! i ve tried everything.. lube it, pull it, force it,,, so right now i leave them there,,mmm,, SOMEBODY HAD THE SAME PROBLEM?? how can i save my OS?¿? many many thanks from barcelona!!! I had this same problem with my Airflow. My bearings fit very tighly on the axles and one could not be removed. I made the big mistake of trying to wedge it off with a screwdriver and hammer and damaged the axle slightly. After the bearing was removed I was fortunately able to sand the axle smooth again and now it is fine. I have been advised by a machinist friend to heat the bearing so it expands slightly to remove it. I think another option might be to clamp the hanger and bearing seperately, pulling them apart. In either case you will probably need to destroy the bearing. Whatever you do, tread carefully around those axles, they're a bit soft. Ever since I had that problem with my Airflow, I've sanded 8mm axles with very fine emery paper until the bearings slide on a bit easier. I don't want to get stuck like that again. first of all, i would like to say sorry, but you got a Ferrari, and you have to take care about it. As long as the truck is so precise, a whiff of oxidation could make a lot of problems. As more you will change your wheels, as less you get in trouble. Please do not use a hammer, or a Axe. You could do it with two normal screwdrivers. All you have to take care is, do it allways symmetric!!!!!!! Please take a look on the fotos. If you still are in fight with your bearing, please contact me directly, or send me a PM. I had the same problem on most TRUE 8mm axle trucks such as AsphaltPlayground Splitfires and 8mm'd RT-S/X's and PPS Indy 8mm trucks. I'm hoping sometime to get an Airflow OS in the future. I did the same thing as Steve Collins, I just got out some fine emery cloth but I wrapped it around metal file(or any other suitable piece of metal with 90 degree corners) to carefully sand circumferentially around the axles to get the bearing to slide on and off with just a hint of snugness. I also put a very light coating of grease/oil on the axles to prevent the oxidation issue Chris Hart mentioned. Re: i cant take out my bearings from the OS axles!!! 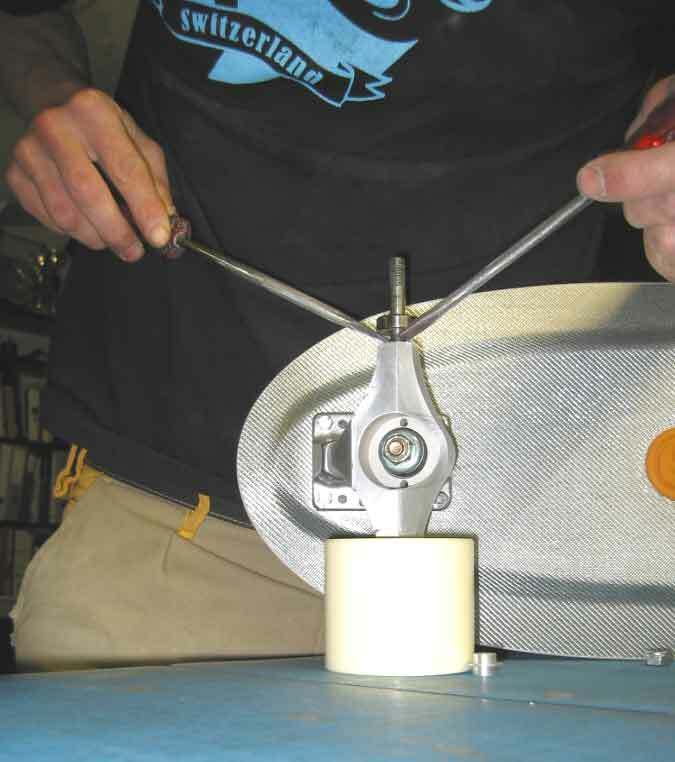 Years later and I got the same problem in my longboard electrico, did the same as Chris Hart. Specially taking care to do it the same way in all the sides to have no trouble later.